Dec. 15: Vets to the government – How do we get your attention? As veterans, we’ve watched with growing dismay a succession of reports about actions by Veterans Affairs that go against the government’s repeated assurances that it is doing the right things for those who served their country. These include: awarding bonuses for Veterans Affairs executives who propose and administer cutbacks; cutbacks in the wrong areas, such as closing veterans assistance offices; confusion about care for veterans with mental-health problems; allowing tens of millions of dollars in Veterans Affairs funding to lapse from vital programs, such as health care, disability and death benefits while exceeding the budget for internal services like communications; issuing misleading statements about how much funding has been applied over how many years – the list goes on. With a federal election looming, the situation naturally becomes embroiled in politics. While many veterans see the issues as being more than campaign fodder, increasingly they are asking what has to be done to catch the government’s attention. Surely the Canadian public is beginning to ask the same question. The Minister’s submission to Parliament is a carefully crafted document by experienced bureaucrats designed to give the impression of strong support to the report by the Standing Committee but laced with delay language such as “further study”, “ third party consultation”, “explore options”, “agrees to explore”, “careful review is being considered”,” intends to continue research”, and “further due diligence”. In short, there is very little to which the government has made a definite commitment to implement now. The following statement is indicative of the muzzled state, of the Department of the Veterans Affairs, whether self-imposed or from above. recommendations. Many of these recommendations involve potentially complex changes to some Veteran programming. The implications of any potential changes must, therefore, be carefully assessed. Therefore, the Government plans to address the recommendations made in the Report using a phased approach. The first stage is to address those recommendations that can be quickly achieved within existing authorities and budgets of Veterans Affairs Canada and the Department of National Defence and which will improve the continuum of service provided to Veterans and their families when they leave the Canadian Armed Forces. -The individual is in a stable medical condition. -The individual’s medical records have been transferred to Veterans Affairs Canada in accordance with privacy legislation, an official copy of the medical files has been given to the veteran, and the initial application for services and financial benefits provided under Part 2 of the New Veterans Charter has been adjudicated by Veterans Affairs Canada. -The individual’s file has been assigned to a Veterans Affairs Canada case manager who has already established contact with the individual. - The healthcare and rehabilitation professionals who will be supporting the individual during transition have been identified in the area where the veteran is planning to live once medically released and their respective responsibilities have been defined. - develop a unified list of service conditions to be used interchangeably by Veterans Affairs Canada the Department of National Defence. - ensure to the greatest extent possible that the service-related condition, identified by the Canadian Armed Forces and that led to a veteran’s release on medical grounds, be recognized by Veterans Affairs Canada for adjudication purposes. -establish a follow-up protocol for all military members who have been released for medical reasons. Veterans Charter, and read as follows: The provisions of this Act shall be liberally construed and interpreted to the end that the recognized solemn obligation of the people and Government of Canada to provide compensation to those members of the forces who have been disabled or have died as a result of military service, and to their dependants, may be fulfilled. That independent access to Veterans Affairs Canada’s psychosocial and vocational rehabilitation services be given to spouses or common-law partners of veterans with a service-related disability, that access to psychological counseling be also given to parents and children of veterans with a service-related permanent disability, and that financial support be provided to family members of seriously-disabled veterans acting as “primary caregivers” as defined under section 16. (3) of the Veterans Health Care Regulations. The Government shares the view of the Committee that support for families is a key component to facilitate a successful transition to civilian life. In this context, we fully agree with its recommendation to extend psychological counseling for Veterans families and will introduce new measures in this regard in due course. That Veterans Affairs Canada undertake a comprehensive review of the amount of the disability award to more adequately reflect awards in civil liability cases for personal injuries, implement a transparent and clear process for determining its value, and improve support for financial counseling throughout the process. That the Service Income Security Insurance Plan (SISIP) Long Term Disability program be provided only to veterans medically released for a disability not related to military service, that all veterans released for service-related medical reasons benefit from the programs offered under the New Veterans Charter, and that the Canadian Forces and Veterans Affairs Canada work together as quickly as possible to eliminate overlap between Service Income Security Insurance Plan (SISIP) programs and those provided by Veterans Affairs Canada. That eligible vocational rehabilitation training programs be allowed greater flexibility, and be less strictly related to skills acquired during military service. The Government fully agrees on the need to ensure maximum flexibility for Veterans and their families with regards to vocational rehabilitation. In 2013, the Government made improvements to the program by expanding the list of eligible training expenses. Veterans are now also able to claim individual vocational rehabilitation expenses through an overall program funding envelope, to a maximum total value of up to $75,800 per person. This change gives Veterans more flexibility in their vocational rehabilitation plans, which are based on the individual needs of each Veteran and simplify training plan approval and claims processing. That Veterans Affairs Canada establish a more rigorous case manager training program, and review the standard under which one case manager is assigned to 40 veterans, to determine if the ratio is appropriate, and to provide necessary resources for its adjustment if required. That Affairs Canada and the Department of National Defence build on their existing collaborative efforts by providing adequate resources for research and understanding of known and emerging manifestations of operational stress injuries. The recent studies in the use of animal therapy for Veterans or related to the role of psychiatric service dogs in treating post-traumatic stress disorder (PTSD) demonstrate the Government’s ongoing commitment to military and Veterans health research. The Government agrees that research in this field is valuable and necessary to develop new tools and treatments that can help Veterans and their families. In this context, the Government intends to continue research that will further inform programs and policies on Veterans’ wellness. For additional detail on research initiatives, see Appendix A, paragraphs 49-61. That Veterans Affairs Canada consider moving towards a payment system that results in one comprehensive monthly payment that clearly identifies the source of funding, while ensuring the net benefit to the veteran is not reduced. That Veterans Affairs Canada and the Department of National Defence, after they have tabled their official response to this report within the next 120 days, also table, by 30 January 2015, a report outlining the progress made on implementing the recommendations in this report, and that the New Veterans Charter, as a “living document”, be amended to include a mandatory review of its provisions to be undertaken by the appropriate parliamentary committees as required. That the most seriously disabled veterans receive financial benefits for life, of which an appropriate portion should be transferable to their spouse in the event of death, that Veterans Affairs Canada consider the use of a probable earnings approach in determining the amount of the benefits, and include better access to the three grades of the permanent impairment allowance, for which eligibility criteria must be clarified. That the earnings loss benefit be non-taxable and set at 85% of net income, up to a net income threshold of $70,000, that it be adjusted annually to the consumer price index, and that for veterans who participate in a rehabilitation program, the disability award be paid once the program is completed. Under current programming, the Earnings Loss (EL) is a taxable benefit designed to provide income replacement during participation in VAC's Rehabilitation Program. It is currently paid at 75% of gross pre-release income which is equivalent to 90% of take home pay. Should the Committee's recommendation be implemented, which would see EL at 85% of net pre-release income and non taxable, there is a potential for some Veterans to receive a lower benefit than is currently the case. Significant analysis and consultation would be required with the Canada Revenue Agency to establish an appropriate definition of 'net income' and further analysis would be needed to compare it to other similar support programs. As such, further due diligence is required to address this proposal. That all veterans with service-related disabilities, and their families, be entitled to the same benefits and support as part of their rehabilitation program, whether they are former members of the Reserve Force or of the Regular Force. Committee Recommendation 6That the Canadian Forces work with Veterans Affairs Canada to make Military Family Resource Centres available to veterans and their families in order to support them in their transition to civilian life. by providing unique services tailored to the CAF community. CAF families and family members can access the services as a family, individually, or in groups. DND and VAC will work together to determine how best to meet the needs of transitioning CAF members and their families without compromising support available to our serving military community. Comment; Addressed in Government response 2. COMMENT: Addresses in government response 3.
once the program is completed. financial counselling throughout the process. COMMENT: Addressed in Government response 8. The following email is some VAC Cheerleading from the A/Deputy Minister. As you know, in September 2013, Minister Fantino called for a comprehensive review of the New Veterans Charter, including all enhancements, with a special focus placed on the most seriously injured, support for families and the delivery of programs by our department. I am pleased to inform you that today in the House of Commons, Minister Fantino tabled the Government of Canada’s response to the Standing Committee on Veterans Affairs’ report, The New Veterans Charter: Moving Forward. In its response, the Government of Canada noted that it agrees with the spirit and intent of the majority of the recommendations made by the Standing Committee on Veterans Affairs. - Amend existing legislation to reinforce the Government’s commitment to support Veterans and their families. These actions make up the first phase of the Government’s formal response. Further analysis is ongoing about any future measures. These are being considered by the Government in the context of the fiscal situation. Further information will be available as decisions are made. As we go about our day-to-day work, you should be proud of the work that we are doing to improve the lives of military personnel and Veterans. Thank you for your unwavering dedication to the Veterans and families that we all so proudly serve. Royal Canadian Legion Branch 212 hosted the Annual Barbeque held by the Ottawa/Gatineau Unit of the Nato Veterans Organization of Canada. Dan Black, Editor of the Legion Magazine. Mr. Black was the quest speaker. His topic was underage soldiers of WW1. He has written a book on that subject. Ken Richardson, member of the Ottawa/Gatineau Unit and National Treasurer. General Paul Manson (Ret.) Former Chief of the Defence Staff and Patron of the Nato Veterans Organization of Canada. Douglas Brunton , member of the Ottawa/Gatineau Unit and National Chairman for Regions and Territories. The skill and dedication of the men and women serving in our Armed Forces are essential to collective security. These brave men and women serve our nations, facing danger and risking injury and death in the course of their duty. Their families also play a vital role, coping with relocation and separation, and enduring the consequences of injury and bereavement. In putting the needs of their nation and their service above all else, the members of the Armed Forces of the nations of the North Atlantic Alliance make immense sacrifices. In return, we reaffirm our support to them and their families, during and after their service, now and in the future. We value the service and respect the commitment of each nation’s Armed Forces personnel and their families. They must know that their sacrifices are not forgotten when they return home, that they will continue to be looked after if they are wounded and when they retire, and that their families will continue to be supported if they are killed. We affirm the importance we collectively attach to this, and commend the efforts being made across the Alliance to maintain and strengthen the bonds between our Armed Forces and the societies from which they come. We will seek to enhance the sharing of best practices and lessons learned in support of our Armed Forces personnel and their families, including on our national approaches to providing medical care to injured personnel and support to families. As we mark the 65th Anniversary of NATO and two decades of operations on land, sea and air, including in Afghanistan and in the Balkans, we pay tribute and express our profound gratitude on behalf of our nations and peoples to all the brave men and women who stood ready to defend the Alliance and our values as well as to those, including from partner nations, who served in NATO-led operations and missions. We honour these courageous men and women, and their families, and place our trust in those who will follow them in years to come. Canada’s Prime Minister, the Rt. Hon. 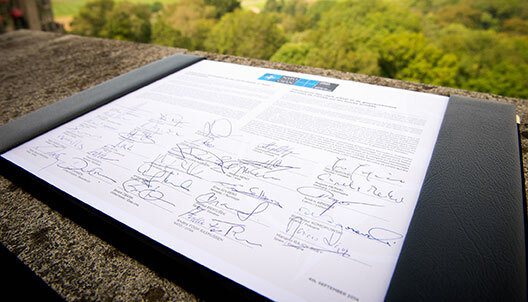 Stephen Harper, is to be commended for being one of the signatories of this Declaration. It is an important affirmation by the Government of Canada of its commitment to support its Armed Forces, Veterans and their families. It can also open the door to a more robust and dynamic information exchange on best practices and lessons learned amongst NATO member states. Canada has much to share about Veterans’ programs and services. Despite problems identified in my recent reports on the New Veterans Charter and the Permanent Impairment Allowance, and the House of Commons Standing Committee on Veterans Affairs’ report, The New Veterans Charter: Moving Forward, Canada is recognized worldwide as having one of the better approaches to Veterans’ affairs. Why? The answer is that generations of Canadians have wanted ‘their Veterans’ treated with respect and fairness. As a result, Canada is one of only a few countries that has an entire federal department dedicated to supporting Veterans and their families; it is the only country with a Veterans Ombudsman and a Veterans Bill of Rights; it provides free legal support to Veterans through the Bureau of Pension Advocates, to name but a few. I believe that if the shortcomings in our Veterans’ benefits and programs are addressed, Canada will have a system that supports serving members, Veterans and their families that will be second to none in the world. At home, that is what our Veterans need; for our NATO allies, it could be something they want to emulate. Veterans deserve no less. Unit 7 Whitby president, Ira Peters joined in a mass dunking for ALS on the Labour Day weekend. NVOC unit was well represented, Dave Barkwell, Dave Walker, Ira Peters, Bonnie Hartley and Bob Hartley. Once again they are trying to get NVOC recognized in the community. A BIG "WAY TO GO IRA", FOR STEPPING UP. Doug forwarded your message to me for response. You raise a very interesting proposition that we have wrestled with for some time. As you point out, there are a number of radical individuals and organizations out there masquerading as Veterans Organizations who are potentially doing great damage to the relationships between Veterans Affairs Canada and the veterans they purport to represent. Fortunately, these groups have been identified and no longer hold much sway with other Veterans Organizations or VAC. The question "one badge for veterans" has been a concept tried a couple of times. Several years ago the Royal Canadian Legion invited a number of Veterans Groups to a conference with the idea of all the other organizations being absorbed by the Legion so we could speak with one voice - The Legion's voice. That concept was rejected out of hand for a number of reasons, not the least of which was the fact that the Legion now is comprised of about only 22% veterans. In the meanwhile the Legion undertook, on its own initiative, to host a conference twice a year in Ottawa of about 20 legitimate Veterans organizations. The Legion provides the location, the administrative staff and the chairmanship but everyone around the table has an equal say in matters being discussed. Until about a year ago the theme was "Speaking with one voice". At that time the minutes of the meetings and the correspondence coming out of those meetings were all carried under the Legion letterhead with the attending organizations listed as attendees. That process has now changed in a couple of ways. First of all the theme of "Speaking with one voice" has changed to "One message, many voices". Secondly, at the last meeting there was a decision taken that the conference would be called "THE VETERANS CONSULTATION ASSEMBLY". In addition, any correspondence emanating from the Assembly will be signed by the Presidents of each organization. All attendees undertook to agree to six priority items in the New Veteran Charter that had to be changed. This was in total support of the Ombudsman's report. Additionally, many of the organizations present had an opportunity to appear before the Standing Committee on Veterans Affairs who were reviewing the Charter. Every organization presented the same items in addition to some of their own. The result is that the Standing Committee has included all these items in their recommendations to Parliament. We will await the results of the decisions of the Government. The foregoing does not answer your question of "One Badge". However, I would doubt that very many veterans want one badge. That is why we have perhaps as many as 40 veterans organizations, not including all the Regimental, Squadron, Ship etc associations. I think the message is the key thing for veterans and if we can achieve a unity in message we are probably much better served. Canada’s veterans are very much in the news these days, with a growing perception that the men and women who served our nation in military uniform are not being well-treated by their government. The June 1st (check date) demonstration on Parliament Hill by veterans caught the public’s attention, as did a recent spate of articles and interviews, some of them very critical. These have reinforced the impression that veterans are not happy these days. It’s not an exclusively Canadian problem. Note for example that the chief of Veterans Affairs in the U.S. recently resigned over problems with the treatment of veterans returning from Iraq and Afghanistan. Here in this country a relatively small element of the veterans’ community has frequently attacked the Veterans Affairs department, primarily over alleged failures in the medical treatment and financial compensation of disabled military personnel, particularly those suffering from PTSD or other debilitating injuries. The Minister of Veterans Affairs Canada (VAC), the Hon. Julian Fantino, has been subjected to heavy criticism over these and several other issues. To be sure, the record of both conservative and liberal governments over the past few decades has been less that perfect. Our military’s heavy involvement in the Afghanistan War has obviously raised the temperature of the debate. Like all wars, this one took a heavy toll on those who were engaged in the conflict, and this has reminded Canadians that the nation has a solemn obligation to care for those who suffered through service in harm’s way. Back in 2006 the government introduced a New Veterans Charter in an attempt to articulate the obligation in practical terms, but not all of it was deemed satisfactory. This dissatisfaction led to a comprehensive review of the Charter by the Parliamentary Committee on Veterans Affairs, whose report has now been published to mixed reviews, with various veterans organizations claiming that the committee’s findings and recommendations do not go far enough. This raises an interesting point. Historically, going back to the aftermath of the First World War, the Royal Canadian Legion has been the dominant voice of Canadian veterans. In recent decades, however, with the passing of so many Second World War veterans, the Legion’s numbers have declined dramatically. Furthermore, fewer than one-third their members today have seen military service, and the percentage continues to decrease. Meanwhile, dozens of new veterans organizations have appeared on the scene. Although all of these, in representing specific groups of veterans, have a legitimate role to play, the net result has been a serious dilution of the collective influence of veterans at large. Against this background a few small militant groups, in going public so forcefully with their criticism and demands, give the impression that they speak for all veterans. But many of today’s veterans – perhaps the great majority – are uncomfortable with some of the rhetoric that has dominated recent headlines. One reason is the growing feeling that the aggressive approach may very well be counterproductive, because of a risk that it might alter the positive image that the Canadian public holds of its veterans, which in turn could influence government support for the community. More to the point, unduly antagonizing the officials of VAC can scarcely lead to a productive working environment in the search for solutions to current problems. Given the weakening of the Legion’s once dominant position and the proliferation of new veterans organizations, there is a need for some form of overarching new veterans organization, perhaps under the leadership of the Legion, drawing together the many and varied groups that exist today. Unfortunately, recent attempts in this direction have not been successful, but the need remains. The entire veterans community must come together from time to time to debate the really important issues of the day, thereby building a strong consensus on how these should be resolved. Only then can veterans speak convincingly and forcefully - yet constructively - in seeking solutions from the government of the day. Although some veterans may not agree, there is a strong case for establishing a powerful collective voice in this way. It provides the basis for a firm yet co-operative dialogue with the government, for the benefit of all Canadian veterans. It’s a move whose time has come. Paul Manson was Chief of the Defence Staff from 1986-89. He is currently the Patron of the NATO Veterans Organization of Canada. This will be of interest to all. The attached photos are small except for the last which is quite spectacular. 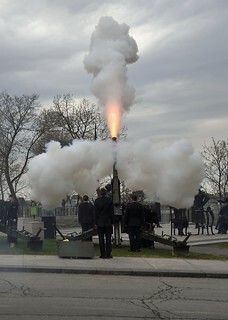 Regardless if you go to this link http://www.app.forces.gc.ca/ndoh-jndc/national-day-of-honour.html and click on “See Photos of the National Day of Honour” you will see a number of pictures of the guns and many more. Well done to the Gunners of 30th Fd. UBIQUE! Thanks to Hugh Mundell for sharing this e-mail. On May 16th, 2014, I released Veterans’ Long-term Care Needs: A Review of Assisted Living Options for Veterans. This is the third in a series of three papers produced by the Office of the Veterans Ombudsman that examine the provision of health benefits by Veterans Affairs Canada to Veterans, family members, survivors and caregivers. I hope that interest in this review will go beyond Veterans and their families and that it will also be of help to any Canadian facing long-term care challenges. The content and findings are a timely evidence-based snapshot of what exists today in both the public and private sectors. It is my hope that it will stimulate discussion and help in the ongoing work being done across the country in this field by federal, provincial and municipal government officials. Both seniors and Veterans of any age with service-related injuries or illnesses may require varying levels of assisted living support due to their medical status at one or more times in their lives. In addition, their health care needs are often intertwined with shelter requirements and the desire to maintain their dignity and independence within their own residences for as long as medically possible. The health care services that are made available to them are normally delivered on a continuum, from independent living in one’s home at one end of the spectrum to institutional long-term and palliative care at the other end. Finding relevant subsidized assisted living information on government websites can be challenging at the best of times and even more difficult when the health of a loved one has deteriorated to a point where it is impossible for them to remain in their home. Greater effort needs to go into making this information easily accessible and understandable given the large number of seniors who will, no doubt, require such support in the near future. Equally, an understanding of assisted living is a key element to ensuring that the health care continuum of Veterans is meeting the needs of Veterans and their families both now and in the future. We know that change is coming within the Veterans community given the declining number of World War II and Korean Veterans. To understand and be prepared for that change, I encourage you to read along with this review, the two earlier published reviews in this series: Veterans’ Long-Term Care Needs: a Review of the support provided by Veterans Affairs Canada through its Long-Term Care Program and Veterans Long-Term Care Needs: a Review of the support provided by Veterans Affairs Canada through its Veterans Independence Program. Restoration of Canadian Army. Since the 2011 restoration of the names of the Royal Canadian Navy (RCN), the Canadian Army (CA), and Royal Canadian Air Force (RCAF) ...our Army’s historic identity continues to be restored by our Government. Lt to Rt, Flag bearer - Secretary Fred Wright; Member- Tim Redmond; New Member- Peter Beswick; President- Gerry Bryan; New Member- Terry Chamberlain; Vice President- Ronald Gowing. Six members of NVOC Unit 5 participated in a wreath laying ceremony held for NATO's 65th Anniversary. 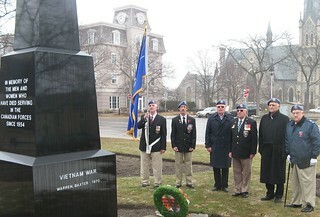 The event was held at the Black Marble Cenotaph on south end of Queen Square in downtown Cambridge, Ontario, at 11:00 am on Friday April 04, 2014. The solemn ceremony was to remember the 587 Armed Forces and 926 Dependents buried in Europe during the cold war, plus the 158 CF members that lost their life in Afghanistan. The wreath is left at the Cenotaph for a full 24 hours. Last Thursday, March 6, the House of Commons Standing Committee on Veterans Affairs continued its review of the New Veterans Charter by hearing from Gordon Moore, Royal Canadian Legion Dominion President, and Brad White, Dominion Secretary, along with Gordon Jenkins, President, and Percy Price, Acting Director Advocacy, NATO Veterans Organization of Canada. There were a couple of recurring themes in the presentations made by these very knowledgeable representatives of Veterans' organizations that I hope left an impression on Committee members. The first recurring theme was the priorities that need to be addressed by the Committee. As I have mentioned in previous blogs, the two reviews and two reports published by my Office since April of last year, namely, Improving the New Veterans Charter: the Report; Improving the New Veterans Charter: The Actuarial Analysis; Improving the New Veterans Charter: the Parliamentary Review; and Investing in Veterans’ Vocational Training pinpoint specific New Veterans Charter program areas that need to be addressed as a matter of priority. "Responsible Canadians, including veterans, support the Government's program to reduce the deficit and national debt to ensure a secure future. At the same time, Canadians surely recognize the need to uphold the nation's solemn obligation towards those who served in uniform, especially those veterans who have special needs. Having put their lives on the line, our veterans have already contributed greatly to a secure future for our nation"
Gord in front of unveiling of VAC Ice Sculpture depicting a train departing for start of WW1. This year’s ice sculpture, commemorating the centennial of the start of the First World War, depicts soldiers saying goodbye to their loved ones as they board a train to depart for war. The troop trains brought many of these young volunteers to Valcartier, Quebec, where the men received their first taste of military training before setting sail for England. 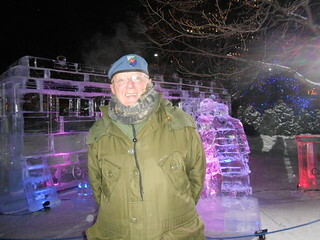 The Troop Train ice sculpture is located in the Crystal Garden at Confederation Park, in downtown Ottawa. For more information on Winterlude 2014, please visit the Canadian Heritage website. Flight Sgt. Nathan Gibbons, 16, presents retired Maj. Bob Rutledge with a medal during the Salute to NATO Veterans ceremony. CAMBRIDGE – The NATO invasion of Cambridge will begin on Friday at noon, when the puck drops to officially open the 116-team Preston International Hockey Tournament. This is the 56th year of the tournament that will see about 2,400 youngsters, ages eight to 10, participate on the ice. The official opening takes place at the Cambridge Ice Centre when Gerry Bryan, president of the NATO Vets Organization of Canada, Cambridge Area Unit 5, drops the puck. Bryan was an engineer, attached to the Royal Canadian Army Service Corp. and served in Germany. Others assisting in the opening ceremonies will be Waterloo Region chair Ken Seiling and Cambridge Coun. Karl Kiefer. It will be the Cambridge Hawks atom AAA facing off against the South Central Coyotes of Richmond Hill. This is only the beginning of a weekend to honour the local men and women who have and are still serving in our Canadian Armed Forces under the NATO flag. 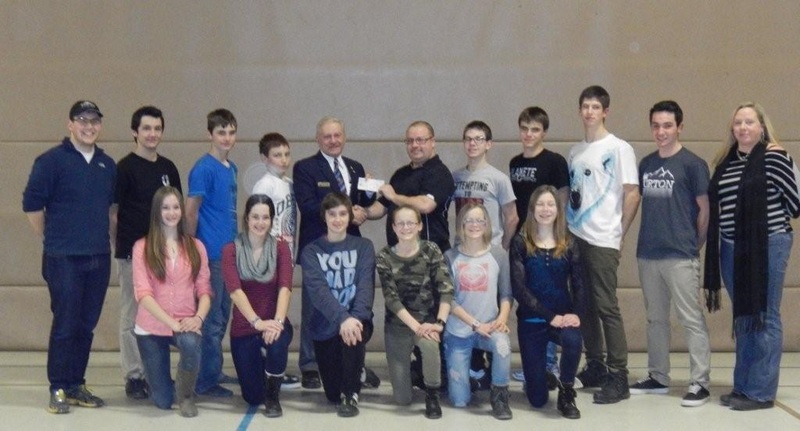 At 10:15 a.m. on Sunday at the Preston Memorial Auditorium, the Royal Canadian Air Cadets All-Star Game will lead into a ceremony on the ice when many local NATO veterans will be honoured. Special medallions will be awarded to Waterloo Region Police Insp. Dave Bishop, Chief Warrant Officer Paul Elliott, a NATO Vets Unit 5 member serving with the 56 Field Regiment, and Dave Sopha, Portraits of Honour artist. Local military personnel have served NATO in Afghanistan, Bosnia-Herzegovina, Croatia, Germany and other European countries. At the Preston Auditorium, Norm Wilson has created a painting of a giant poppy at centre ice to remind players and spectators of the sacrifice so many local police and military personnel have made on the other side of the world. Two bands will participate in the ceremony, Drum and Pipes Band of 822 Squadron and Drew Leith and the Foundation. Members of the Army, Sea and Air Cadets will be making some special presentations during the ceremony. All tournament games, including the NATO ceremony, are free to the public. Formed to promote fellowship amongst its members and be a dedicated voice for all veterans, the Nato Veterans Organization Of Canada - Unit 7 received its charter last month. 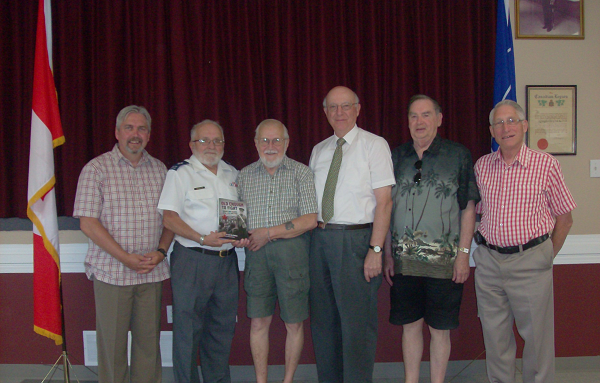 Members of the Whitby branch were presented with the charter by Nato Veterans Organization Of Canada's Director Regions and Territories Doug Brunton. The group meets once every two months, with membership open to all serving members - regular and reserve forces - as well as all former serving members. For more information, contact Bob Hartley at bobhartley44@yahoo.ca.